Sweden, 1958, 107 minutes, Black and white. Max von Sydow, Ingrid Thulin, Gunnar Bjornstrand, Naima Wifstrand, Bibi Andersson. The Face is an early Bergman in terms of his international career although he had been making films since the 1940s. He had come to world prominence in the mid-50s with a range of films including Smiles of a Summer Night, The Seventh Seal and Wild Strawberries. The Face was made immediately after these films and led to a series of outstanding films including The Devil’s Eye, his trilogy including Through a Glass Darkly, Winter Light and The Silence. He continued to make striking films for many decades, some of the later films being autobiographical, especially Fanny and Alexander. His last film was made for television in 2003, Saraband – which took up the characters from thirty years earlier in his Scenes of a Marriage. The Face is a mysterious story. A group of wandering magicians – Vogler’s Magnetic Health Theatre – arrives in a town. The townspeople are anxious about stories they have heard of performances and want the troupe to display what they do before they will be allowed to perform. The question is how genuine are the powers that Vogler and his assistants have. How much is trickery? Are they charlatans? The film is about truth and reality, illusions. The film also focuses on people’s credibility, believing magic, wanting to suspend disbelief. 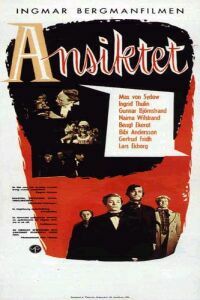 The themes are intriguing – and the stars are Bergman regulars Max von Sydow, Ingrid Thulin, Gunnar Bjornstrand and Bibi Andersson. They featured in many of Bergman’s films from the 50s to the 70s. 1.Ingmar Bergman and his film-making in the 1950s? The early years of his career? His international fame in the mid to late 50s? His skill in creating characters, drama? Meaning in life? 2.The re-creation of the period, interiors and exteriors, the black and white photography, the use of light and darkness, close-ups and tableaux? Editing and pace? The musical score? 3.The title, the focus on the magician’s face, authentic or charlatan? Bergman and his critique of illusions? The face seen, the anonymous artist, tricks or reality? Suspension of disbelief by the audience? Critics? The happy ending? 4.The strength of the cast, their appearance in Bergman’s other films? Parallels to their characters in the other films? Commonality of names? 5.The introduction to the troupe, the mood, their appearance, the actor and his death? Travelling the countryside, the coach? The interactions amongst themselves? Suspicions at the border? Their using their confidence-trick ways to get themselves in? 6.Max von Sydow as Vogler, his appearance? Reputation? The assistant, the manager, the driver? The granny? The magic and the potions? The imprecations? 7.The arrest, the role of the chief of police, the official and his wife? Meeting with the doctor? The lawyer? The buffoonery and the drinking? The official and his manner – and spying, being cuckolded? Medicine, science and reason? 8.The interrogation, the experiences of Nesma and discussions about him? Experiments and tests? The varied responses? Vogler and his silence? Reactions? 9.The night, the house and suspicions, the husband and wife, the meal, the marriage and Sarah? The maids? The driver and his sexual encounter? The potions and beliefs? The echoes of Summer Night? 10.The doctor, with Manda? The advances, Vogler’s reaction? Real rather than illusion? The test for Manda? Her leaving? 11.The demonstration, the wife laughing, telling the truth about her husband and his boorish attitude? The strong man in chains? 12.The death, the ending, the autopsy, reactions? The details of the autopsy, the coffin, the actor and his death? His appearance and frightening people? The doctor? The fear of death? 13.The other people in the town, their reactions, their fears? Their being mesmerised? Vogler, the charlatan, the money? The final invitation to the court and his being happy? 14.The themes of artists, performance, critics and their responses? 15.The dialogue, Ingmar Bergman’s themes, truth and illusion, the particular religious focus on God, presence and absence?